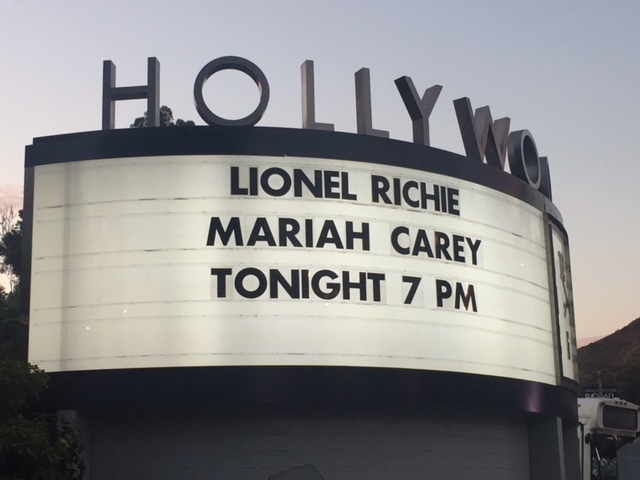 Appropriately called “All the Hits Tour,” last night’s (Monday, July 31) Hollywood Bowl sold out Mariah Carey and Lionel Richie co-headlining concert delivered chart topping hit after another chart topping hit. Dressed in a dazzling gold sequined floor-length dress, the diva extraordinaire Mariah Carey got the evening started. The singer has sold more than 200 million records worldwide, making her one of the best selling artists of all time. She has won 5 Grammy Awards, 19 World Music Awards, 11 American Music Awards and 14 Billboard Awards. From the very first note she belted out to very last, it was non-stop hit after hit. She performed music from just about each of her albums including her self-titled debut, “Music Box,” “Daydream,” “Butterfly,” “Rainbow,” “The Emancipation of Mimi” and “E=MC2.” Together with a full band behind her and several unbuttoned male dancers, Carey delighted the crowd with some of her favorites from these collections. 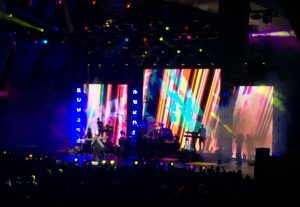 During most of the songs, the music video played on a screen behind the singer. She performed “Heartbreaker,” “Touch My Body,” “My All,” “Don’t Forget About Us,” “Vision Of Love,” “Hero” and more. 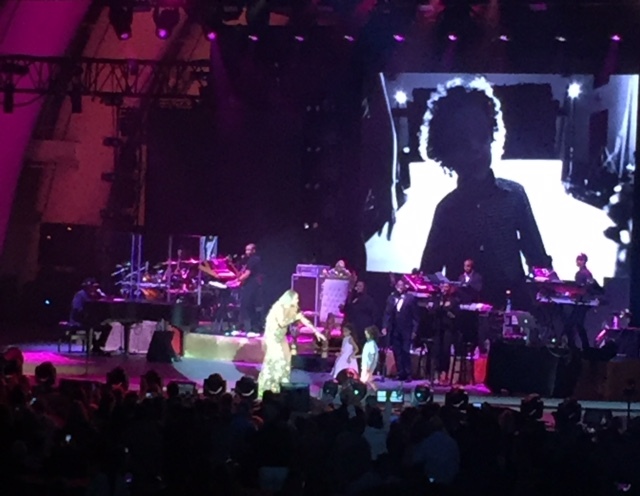 During her 1996 tune, “Always Be My Baby,” she brought out her 6-year-old twins Monroe and Morrocan to sing with her on stage. “We learned this song the other day,” she told them as they sang along. Despite being very shy, they did eventually sing a few notes into her microphone. Meanwhile, behind them on the large center screen, black and white family photos and videos were projected. No Mariah Carey concert is complete without hearing the singer showcase her five-octave vocal range and ability to reach beyond the 7th octave – something she did throughout the show. The largely female audience couldn’t get enough. The “lambs” (her term of endearment for fans), came out in full force ready to sing along, many of them wearing all kinds of Mariah Carey shirts and accessories. Next up was the very stylish and distinguished looking Lionel Richie. Looking very dapper dressed in black pants, shirt and a metallic silver jacket, he greeted the audience with a simple “hello.” The crowd went wild for that but instead of beginning that particular hit song, Richie began his set from behind the piano, performing “Easy” and others, including “Running With the Night,” “Penny Lover,” “Hello,” “Truly” and “You Are.” In addition to the show’s opener, he performed other songs from his time with The Commodores, including “Three Times A Lady” and the classic “Brick House,” after which he and his incredible band kept the funk flowing with an incendiary take on Ohio Players’ classic “Fire,” complete with flames shooting up from the stage. “We Are the World” was Richie’s last song before the encore. Before singing the 1985 charity single, he talked about all the incredible singers of his generation that we have lost like Glenn Frey, Prince and Michael Jackson. He happened to write “We Are The World” with Jackson so he felt it was fitting to end with this tribute to him. The words to the song scrolled across the screen so everyone at the Bowl could really participate in a giant sing-along. Finally as the encore, Richie really let the Bowl have it and he belted out his 1983 smash “All Night Long.” Most people were on their feet by now and dancing couples could be seen everywhere. Richie has sold over 100 million records worldwide, making him one of the world’s best-selling artists of all time and he has also won five Grammy Awards. A seasoned performer, it was clear early on just how much Richie loves being on stage and singing. His banter with the audience was funny, charming and endearing. He also joked throughout his set and remarked at people’s goofy dance moves. With a combined total of roughly 70 years of making music and selling out venues, it’s no surprise these two superstars joined up for this tour. Richie and Carey’s 22-show tour launched on July 21st in Oakland and will wrap up on September 5th in Seattle. Purchase tickets here. An Interview With Punk Band ICE NINE KILLS About Their Involvement With PUNK GOES POP VOLUME 7 And More!